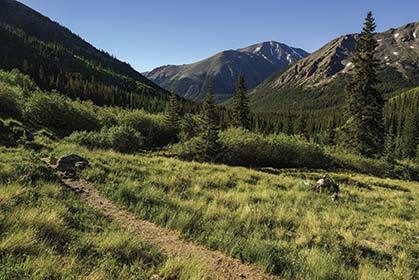 On a June day in 2013, Ginny LaForme and her husband, Eric Robinson, then 63 and 45, stepped onto a trail by out-of-the-way Clohesy Lake, located at 11,000 feet in the heart of Colorado’s Sawatch Range. They switchbacked up 800 feet to where the trail ended in a boggy, spruce-lined meadow, slogged across it and followed a sparse string of cairns along the edge of a steep boulderfield on the east flanks of 14,003-foot Huron Peak. They were in the middle of nowhere, an obscure basin unknown to hikers. Then they saw another runner picking his way across the talus from the other direction. The runner, Gavin McKenzie, had the very same thought. Two months earlier, McKenzie, then 29, had moved from urban Boulder, Colorado, to the mountain town of Leadville, in large part to train for Nolan’s 14, a linkup of 14 14,000-foot peaks in the Sawatch. Huron was one of those 14ers, and the descent down the mountain’s eastern slopes to Clohesy Lake one of the route’s trickiest sections. Ginny LaForme on Tabeguache in 2014. Photo courtesy Ginny LaForme. When McKenzie met LaForme and Robinson, who were indeed reconnoitering for Nolan’s, he realized he knew them by reputation. In the early 2000s, the couple, who live in Berkeley, California, had been among the first to attempt what was then an obscure, semi-organized race. In 2013, they planned to run Nolan’s again, and knew they’d better brush up on the specifics of the complex route. LaForme, Robinson and McKenzie haven’t been the only ones to exhibit renewed interest in Nolan’s over the last two years. As word of mouth and snippets of media attention have spread, Nolan’s, once on the fringes of mountain running, has surged in popularity. When McKenzie began his second attempt at Nolan’s on August 29th, 2014, he was one of 10 runners starting that day alone. With participation in everything from trail 5Ks to 100-mile ultras booming, many trail runners have been drawn to testing their endurance on “fastest known time,” or FKT, efforts, away from the schedules and crowds of organized events. Nolan’s, one of the hardest FKTs out there, is no exception. As Will Carlton, 40, of Steamboat Springs, Colorado, puts it, “What do you do after you run a 100? 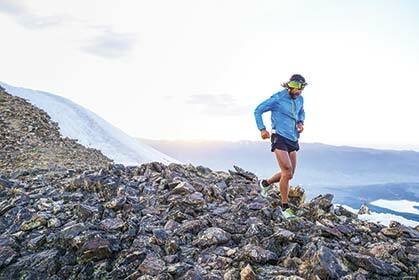 What do you do after you run Hardrock?” The Hardrock 100 Mile Endurance Run, widely touted as one of the toughest footraces in the world, has almost 34,000 feet of climbing and an average elevation of 11,186 feet. “I want to find that next level, that next thing that scares me,” Carlton says. A sunny stretch of trail between Massive and Elbert. Photo by Caroline Treadway. Because runners can decide between roundabout detours and direct but more technical traverses, the distance they cover during Nolan’s varies, but the usual cited range is 88 to 106 miles. Regardless of distance, they climb approximately 45,000 feet—assuming they don’t get lost, which is common even among veterans. To date, nine people have run a sub-60-hour Nolan’s, trailhead to trailhead. Just one, John Robinson, in 2002, has broken 55 hours; his 54:57 finish still stands as the fastest known time. The idea of Nolan’s dates back to the early 1990s, when an electronics engineer named Fred Vance wondered why the so-called mountain ultras he was running didn’t actually go over any mountains. 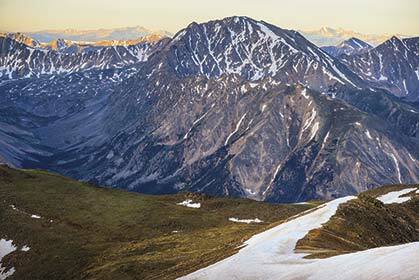 The Collegiate Peaks Trail Run, for instance, a 50-miler Vance ran in 1992, took place on the valley floor outside of Buena Vista, under the sweeping ridgelines of the Collegiates, a group of five peaks in the Sawatch. 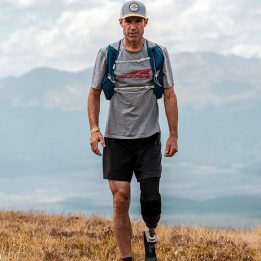 Even the Leadville Trail 100, which he ran in 1991 and again the following year, only skirted the eastern slopes of Mount Massive, Mount Elbert and La Plata Peak in the northern Sawatch. So Vance, then in his late 30s and living in rural Parker, Colorado, approached a colleague of his, Jim Nolan, who had climbed all 54 of the state’s 14ers. 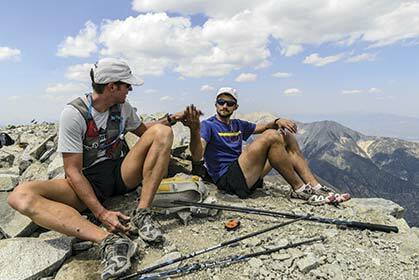 Vance asked Nolan to cram as many 14ers as possible into 100 miles. A week later, Nolan brought a stack of topo maps to work. He had briefly considered some combination of 14ers in southern Colorado’s Sangre de Cristo Mountains, but they were too spread out and technical. The Sawatch 14ers were the obvious choice: 15 sprawling, sloped massifs, 14 of them bunched in a roughly 50-mile north-south line. Vance planned to try the route in the summer of 1992, with Nolan supporting him, but before he could, he accepted a job offer in Silicon Valley. 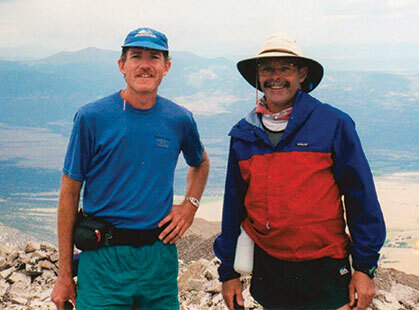 On a late-August morning in 1999, Vance, Wood and Gordon Hardman, another Hardrock runner, arrived at the Blank Cabin trailhead below Mount Shavano to see how many 14ers they could summit in a 60-hour push. Nolan, himself not a runner, was there to crew and look out for Vance and the others. As a mountaineer, Nolan was concerned the three runners would move too fast over technical terrain or push through fatigue until they made poor decisions. No one finished that first year. The weather was dreadful all weekend: raining in the valleys, with snow and hail higher up. Vance and Nolan had hiked the Sawatch high country over the summer, scouting sections of the route, but much of their knowledge was theoretical. Nolan and several other volunteers had planned to set up rudimentary aid stations between some of the peaks. A few were at accessible road crossings, but others were miles into the backcountry; the volunteers would hike in, hang a rain tarp between trees and boil some water for soup. Vance had told them when to expect the runners, but his estimates were essentially guesses. The three runners climbed the first peak, Mount Shavano, together, and continued across the mile-long saddle to Tabeguache Peak, where Wood and Hardman pulled ahead. One month earlier, Wood had won the 1999 Hardrock in 30:10, the second-fastest finish to that point; Hardman had finished 14th, in a little over 34 hours. Vance, a self-described “back-of-the-pack sort of ultrarunner,” was content to drop back. Enduring the first night’s storms, Wood and Hardman, who had stayed together, came down off Mount Yale, the fifth peak, to a trail intersection where one of the backcountry aid stations was supposed to be, but wasn’t. The volunteers, unsure where exactly the rendezvous point was, had set up a few hundred yards down the trail. Wood and Hardman ate all their remaining food on the spot, then climbed the next peak, Columbia, in the light of day. They traversed the summit ridge to Mount Harvard in a snowstorm. When they descended and reached the next aid station, six hours behind schedule, the volunteers had packed up and left. Wood was wearing blue-and-yellow parachute pants he’d stitched himself and a purple rain jacket. Hardman was in red tights. Both were splattered with mud. Vance, meanwhile, was still out there, some eight hours back. On the second night, at a resupply point after Mount Yale, Nolan recalls that Vance sat down to pump water through a filter, “drifting in and out of consciousness.” Curious about the mindset of these ultrarunners, Nolan tried to talk Vance out of continuing, “just to see what his response was.” Vance, semi-lucid, refused to quit. After 36 hours, Wood and Hardman had made it no farther than Harvard, the seventh summit. The next morning, pushing the 60-hour limit he had set, Vance hiked out after Harvard as well. After 1999, Vance stopped running Nolan’s in order to focus on managing what was becoming a semi-organized run. In 2000, there were six starters. Wood and Hardman were running again. Vance’s friend Joe Florio and a reluctant Nolan had earned entry by volunteering during the previous year, and Vance had invited two more Hardrock finishers he knew, Eric Robinson and Matt Mahoney. Runners and aid-station volunteers carried two-way radios, to avoid the miscommunications of the year before. Vance also changed the direction, starting from the Leadville Fish Hatchery in the north and ending, at least in theory, at Blank Cabin in the south. 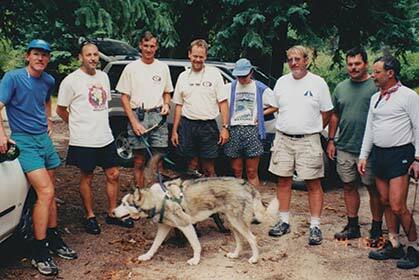 In fact, the 2000 run ended three summits short of Blank Cabin. Heavy storms battered the runners all weekend. On Yale, the 10th peak, Wood was pinned at treeline for nearly an hour waiting out an electrical storm, on a slope so steep he had to brace himself against a ponderosa pine to keep from sliding backward. Still, he managed to reach Princeton before the 60 hours ran out: 11 summits, then a course record. A year later, on a Thursday morning in August 2001, 12 runners gathered at the Leadville Fish Hatchery, the conventional southbound starting point, for the third running of Nolan’s. It was the start of an exceptionally clear weekend, interrupted only by a few light drizzles. And, after two summers of scouting on odd weekends and trading beta, the most efficient lines had been more or less sussed out. All 14 summits seemed within reach. As a teenager in the 1960s, LaForme had lived in Ecuador and Paraguay. She got out to the mountains regularly, on foot and later on horseback, and ran track in 10th grade; as a girl, she wasn’t allowed to run anything longer than 100 yards. In her 20s, LaForme became an avid rock climber who would run back down to the bases of the walls she ascended. She worked for Outward Bound, the outdoor-education nonprofit, and always ran the “marathons” of varying distances the organization held after its courses. 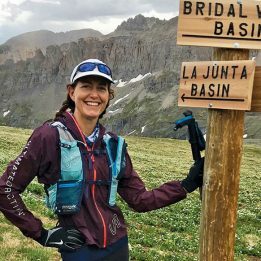 Later, LaForme trained for a couple (real) marathons and, in 1997, at age 47, attempted her first Hardrock 100, making it as far as mile 75 before dropping. Nolan’s appealed to LaForme’s rock-climber roots. “I still like to do things that are as close to rock climbing as you can get without having to use ropes,” she says. In 2001, LaForme summited Massive, the first peak, within an hour of the leaders, but by nightfall Wood and three others—Mike Tilden, an ultrarunner from Salt Lake City; Tilden’s running buddy, Jim Nelson; and John Robinson, Eric’s brother—had pulled ahead. Wood, Tilden, Nelson and Robinson worked in loose collaboration through the next day and night. On the third morning, Wood was taking his time at an aid station after Princeton, when Nelson ran up to him. “Mike took off. He left me!” he said. Tilden had bolted out of the aid station, chasing John Robinson, who had a 40-minute lead. Wood and Nelson set off for the last three summits together. 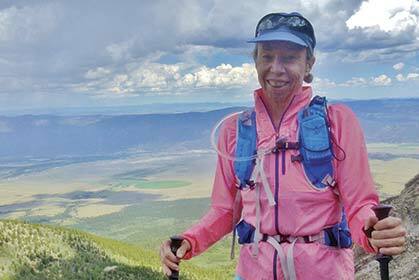 Around 1:30 p.m., a dehydrated LaForme hauled herself up Mount Princeton, 10 hours behind. She wanted to go on, but Vance and Nolan, standing at the summit, told her she wouldn’t have time to reach Mount Antero. “Just stay here,” one of them said. “We need witnesses.” Steve Bremner, one of the runners, and his fiancé, Laila Hughes, were getting married on the summit later that afternoon. Nolan officiated, on the authority of a dodgy minister’s license. Three peaks over, on Shavano, Wood and John Robinson tuned in to the ceremony on their FRS radios. LaForme served as best woman, and Eric Robinson as best man. John and Eric Robinson had grown up in Oregon, in a family Fred Vance describes as “ultrarunning royalty.” In the 1970s, their mother took up running, and by the end of the decade was doing ultras regularly. Eric ran his first marathon at age 9, and his first ultra, the 40-Mile Timberline Trail Ultramarathon, at 11. As best man and woman in 2001, Robinson and LaForme were recent friends, with little idea they’d be married themselves three and a half years later. Matt Hart nears the summit of La Plata in 2012. Photo by Fred Marmsater. An hour and a half before the Bremner-Hughes wedding, Tilden had radioed Vance from the summit of Shavano, the final peak. Tilden raced down the final descent, reaching Blank Cabin with an hour and nine minutes to spare. Forty-seven minutes later, Wood came in. “Why didn’t you win?” he was asked at the trailhead. “Well, if I had known it was a race, I would have gone faster,” he said. Only Tilden and Wood officially finished in 2001. John Robinson and Jim Nelson made 14 summits, but came in after the cutoff. LaForme, Eric Robinson and Bremner reached 11 summits, and two others made it to 10—efforts nobody considered DNFs. Whether or not Nolan’s in 2001 was a “race,” by 2003 it had started feeling that way to Fred Vance. That year, the number of people contacting him about Nolan’s exceeded the maximum 15-person group size that federal wilderness regulations allow. “It was starting to feel like an organized event, where you have to limit or have a lottery,” he says—something he had been rebelling against when he had started Nolan’s in the first place. Nolan’s had even acquired a quasi-official webpage, created by Matt Mahoney. Mahoney, an engineer and ultrarunner based in Florida, would spend part of each summer running in the Colorado high country, first at Hardrock—where he was known to bring the barefoot running he practiced on his hometown beaches to the lingering snowpack of the San Juans—then in the rugged Sangre de Cristo Range, before capping off the season at Nolan’s. Mahoney’s Nolan’s page—not an official race website, but the authoritative source for Nolan’s results—began as a place to post photos and reports. But in 2003, Forest Service rangers came across the site, where they read about aid stations and course records, and notified Vance by email that holding an organized event in a wilderness area was illegal. So he told participants that the run was canceled, warning them that rangers would ticket anyone who showed up to the start. LaForme, Eric Robinson and a couple other diehards ran part of the course anyway, starting at a different location and time. But the organized event—to the extent that it was ever organized—was over for good. 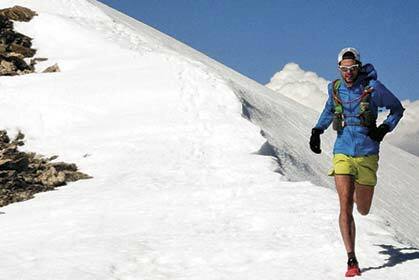 The next year, in 2004, Vance went back to the Sawatch, to run Nolan’s self-supported. The precipitation was heavy that year, and he spent two nights in a bivy sack waiting out the rain. After four peaks, he’d had enough. 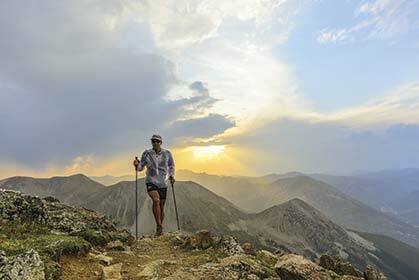 Anton Krupicka on Mount Elbert during his 2013 attempt. Photo by Caroline Treadway. Only three runners—Tilden and Wood in 2001 and John Robinson in 2002—had finished Nolan’s under the official cutoff before the event was cancelled. Over the next several years, a handful of runners tried the route on their own as an FKT-style run, but none got farther than nine peaks. Then, in August 2012, ultrarunners Matt Hart and Jared Campbell became the fourth and fifth people to complete Nolan’s 14 in its allotted time, finishing at Blank Cabin in 58:58 (see “Peak Bagging in Colorado,” Issue 88, June 2013). Two weeks later, Eric Lee, a scientist and ultrarunner from Boulder, Colorado, became the sixth, in 57:27. The next year, 2013, Julian Smith, then 47, an engineer from Colorado Springs, ran 12 summits of Nolan’s solo. After, he reflected on the strain he had put on his family and friends—they had driven the length of the Sawatch, stopping at out-of-the-way road crossings or hiking deep into the backcountry at all hours of day and night, to crew for him. He thought, What if all of us interested in Nolan’s pooled our resources and helped each other out? 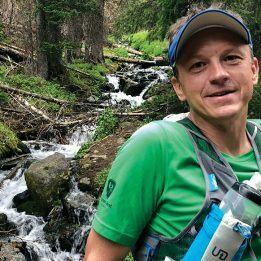 The next spring, Smith reached out to other Colorado runners through a Nolan’s page on Facebook and the running group Coloradans Running Ultra Distances. Immediately, several people said they’d be interested in giving it a try, and others, including old Nolan’s hands Blake Wood and Steve Bremner, volunteered to come out and support them. After weekend scouting sessions that summer of 2014, a loosely coordinated group of eight runners, including Smith, decided to attempt the whole thing over Labor Day weekend, starting August 29th. The same morning, Gavin McKenzie was beginning a separate attempt with Brandon Stapanowich, 30, of Boulder. Smith’s group started together, but the 4,500-foot climb up Mount Massive quickly spread them out. Smith stayed with his friend Will Carlton in the middle of the pack, and a few others started to drop back. Then McKenzie and Stapanowich, who had been delayed half an hour trying to get their SPOT tracker to work, “came streaking by us, like we were just standing still,” Smith says. There was an inch or so of snow high up on Mount Massive, and also on the second peak, Mount Elbert, Colorado’s highest at 14,433 feet. McKenzie and Stapanowich summited Elbert around 11 a.m. and followed a mile and a half of ridge over a 14,134-foot subpeak, then switchbacked down a muddy trail to Colorado Highway 82 in the midday heat. Into the night and through the next day, McKenzie and Stapanowich continued to run well. They dealt with the things that come standard on 60-hour mountain runs—stomach distress, fatigue, navigational hiccups, mountain goats blocking the trail—but the weather held, they never strayed too far off course and their mood remained upbeat. Meanwhile, Smith was struggling. Carlton had needed an extended rest after descending La Plata, so Smith had gone on to Huron, the next peak, alone. When he summited around midnight, his lungs were starting to feel congested, a possible sign of pulmonary edema. He spent three hours working his way down the east slope of Huron. Going up the next peak, Missouri Mountain, Smith lacked the strength to walk more than 25 paces at a time. He finally reached the summit at sunrise on the second morning, and followed a ridge on to mounts Belford and Oxford. By then, though, he knew he was done. He met Steve Bremner at the Pine Creek aid station after Oxford, and they hiked the 10 miles out together, Smith coughing the whole way. Gavin McKenzie trains for Nolan’s on the last of Elbert’s snowpack in summer 2014. Photo courtesy Gavin McKenzie. Around the time Smith summited Missouri, Ginny LaForme had started a run of her own from Blank Cabin in the south. In 2013, inspired by Lee’s finish, she and Eric Robinson had returned to scout the route for two weeks before Robinson, supported by LaForme, made a five-summit push. This year, they had done the same, with LaForme running and Robinson crewing. The first three summits went smoothly for LaForme, but Princeton, the fourth, took her all night. Descending, she was moving slowly; her knees and feet hurt, and 60-mile-per-hour winds whipped the side of the mountain. Below, she saw a trio of lights moving toward her: McKenzie, Stapanowich and their pacer. They hugged, high-fived, exchanged words. For LaForme, alone in the dark, it was an emotional boost. The next day, she summited Yale, then Columbia. Another night fell. Eric had programmed waypoints into a GPS device, and, in her sleep-deprived state, she decided she had better stick to them. Eventually, she crossed the ridge to Mount Harvard. It was now her third morning, and she shared the summit with a group of hikers. “Where did you come from?” they asked. She met Robinson after descending Harvard, and napped for about an hour before summiting Oxford and Belford. At that point, her feet and knees were giving out, and it had been 65 hours since she started, so she settled for Nolan’s 9. When they met LaForme going the opposite direction, McKenzie and Stapanowich were on their last big hurdle. The descent off Princeton was “miserable,” Stapanowich says: a steep talus slope, 40 or 45 degrees in places. The loose rock would slide several feet with every step, so they staggered their descent, taking shelter behind outcrops where they could. The last three peaks went as smoothly as anything can 50 hours into Nolan’s. Just before 2 p.m. on their third afternoon, the two runners arrived at Blank Cabin, 56 hours and 19 minutes after starting. About 10 people, including Julian Smith, were waiting. The group hung around for an hour or so, eating roast chicken and exchanging stories, then packed it all up. The clear weather had held all weekend, but as they drove off, it started to snow. In all, more than 20 runners attempted Nolan’s 14 in August and September 2014. Three of them finished in 60 hours, and two more reached the final trailhead after the cutoff, including one who completed the route self-supported. Many of those who attempted—or finished—this year will likely be back. Nolan’s is sometimes described as a “project,” in the sense climbers use the word: a difficult line that requires multiple attempts over a span of years before it can be completed in one go. Many of the names most associated with Nolan’s—Fred Vance, Matt Mahoney, Ginny LaForme, Eric Robinson and others—have never completed the project. Paul Cuno-Booth is Trail Runner‘s assistant editor. He has made it three-quarters of the way up one of Nolan’s 14.